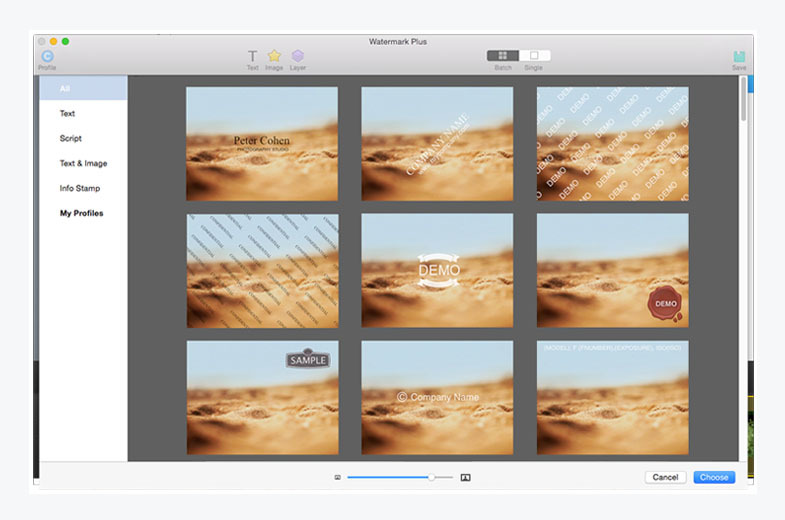 The completely all-in-one watermark maker on Mac that helps you batch watermark photos, quickly resize, rename and convert bulk of photos at a time. 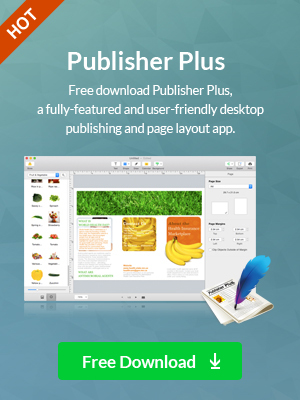 Support all common image formats like JPEG, TIFF, BMP, PNG, etc. Support zooming in and out to view the photos. 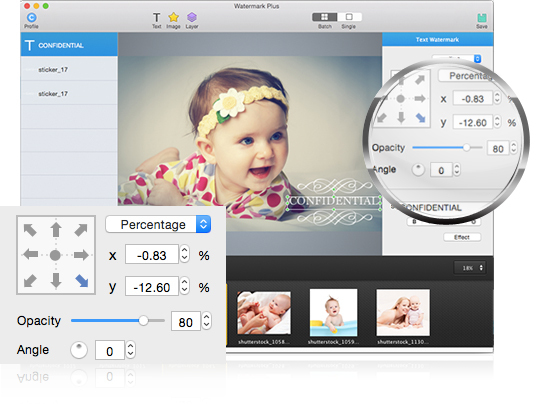 WYSIWYG - Adjust watermark with real-time preview before converting. 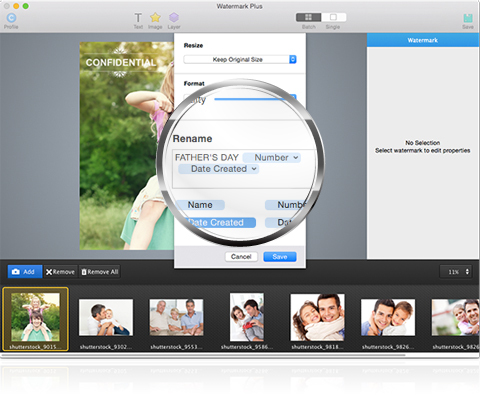 Apply image and text watermark to hundreds of your photos in batch. Support saving your own watermark designsas Profile for easy and quick use later. Script watermark - Fill your photos with text tags. Text adjustment options are also available. Support inserting info stamp as watermark, such as created date, EXIF info, etc. Support adding several text/image watermarks at once. Group/Ungroup them as a whole for easy operation. Freely adjust watermark’s layer and opacity. Position and rotate it anywhere you want. Single Mode - Watermark on each photo can be separately adjusted with different position. Auto snap watermark to photo/objects. 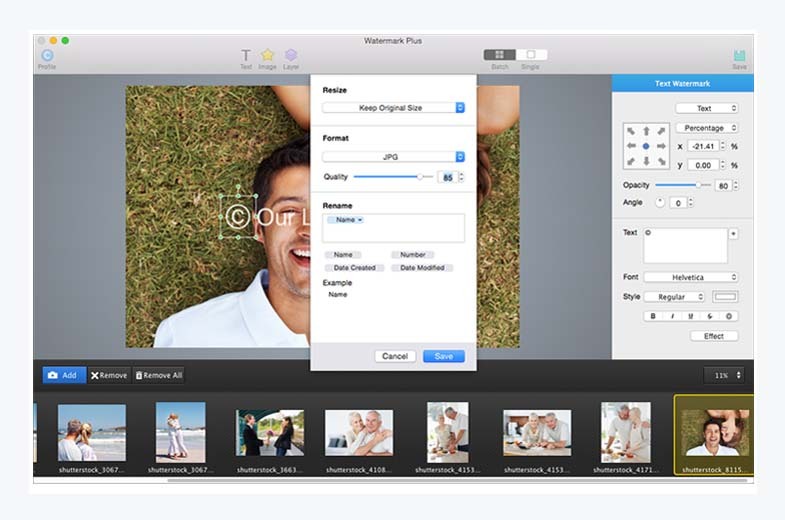 Quickly place watermark on photos with the relative controller. Automatically fit watermarks to different size of the photos. Free to customize text font, style, color, alignment, etc. Set Stroke, Glow/Shadow Effect for text watermark. 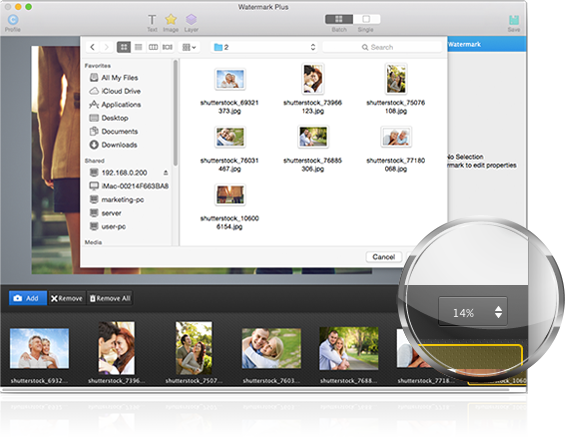 Batch resize the photos by Width, Height, Percentage, or Fit Size. 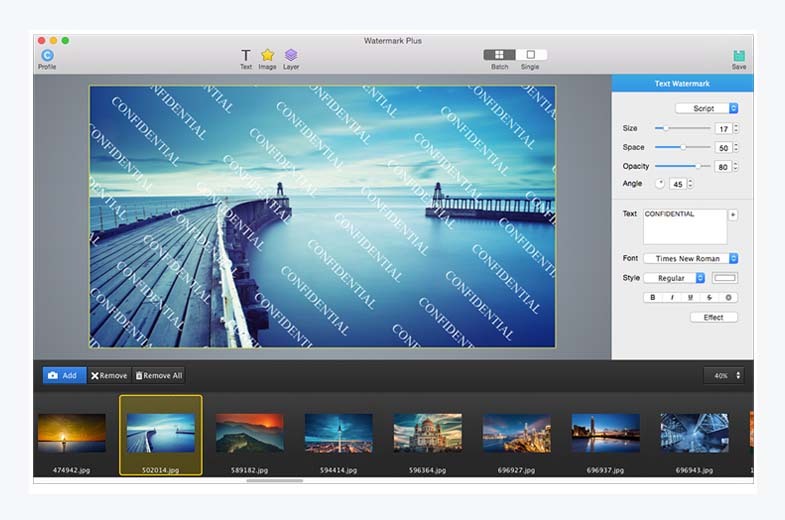 Batch convert your photos to JPEG, PNG, BMP and TIFF in mere seconds. 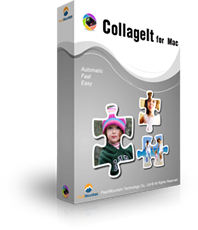 An easy-to-use and automatic collage maker that helps you create eye-catching photo collages on Mac OS X with just a few clicks. 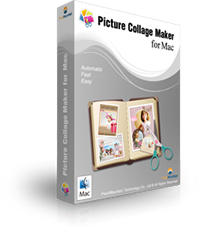 An easy and quick collage maker for Mac to turn your digital photos into awesome photo collages with limitless creativity. I need to add water marks on photos for copyright protecttion sometimes. This app is useful to me. 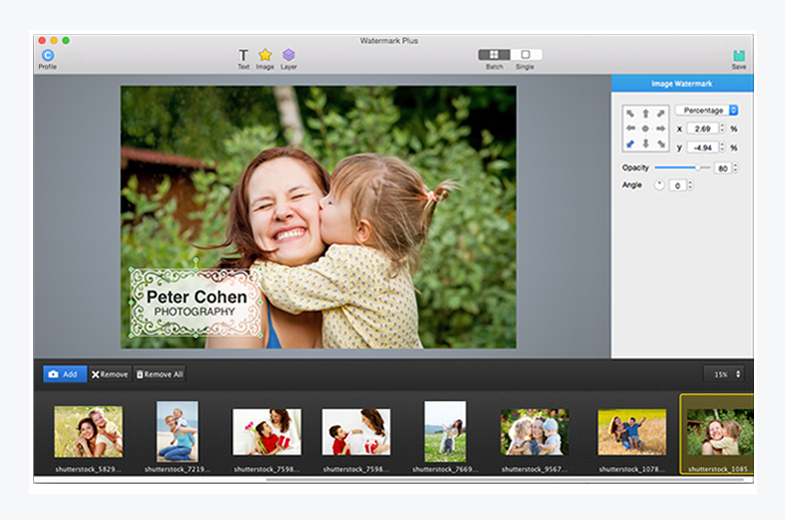 It is easy to add text and image watermarks to photos in a batch. I can add descriptive captions to my photos. This app is great. Adding text watermarks is rather easy in this app. Also a few image stickers can be applied (or you may load your pictures as the watermark). Pretty good app to reset the size of the photo,add watermark,add text content and so much more.Like its powerful function!! I enjoy the fact that I can add my own watermarks. This app is easy to use and fun to experiment with! GET IT NOW! !